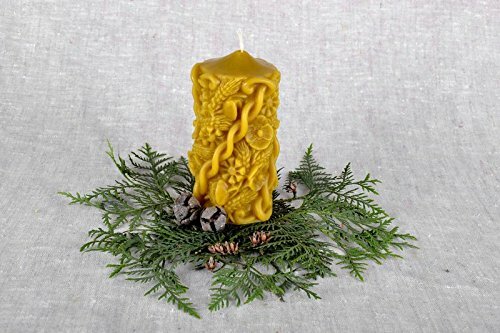 DETAILS - This decorative candle "Nature riches", a wax candle reveals beauty of the nature. Wild flowers intertwine with spikes and withe in it. Being made of natural beeswax, it exhales the smell of honey and meadow herbs. This candle is the work of art, so it doesn't matter if you don't want to burn it. It can serve you as an original figurine as long as you wish. CARE - Recommendations for care: keep in dark room protected from direct sunlight at the temperature from -20 to +25 Â°C. Protect from damages. Expiration date: unlimited. To buy candles, what candles, burning candle, candles for, carved candles, candles, wedding candles, gift for grandmother, gift for new year, candles made by hand, beautiful candles, candle, wax figure, at the candlelight, original candles.